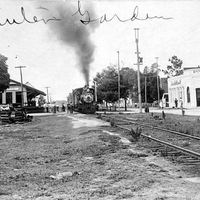 An Atlantic Coast Line (ACL) Railroad Company train coming in to the depot located at 1 North Main Street in Winter Garden, Florida, around 1915. Aspects of the downtown business district of Winter Garden are noticeable in this photograph, such as the Bank of Winter Garden on the right and the Shelby Hotel on the left. In 1895, the Orange Belt Railroad first train depot was constructed. A new depot was built in 1902, shortly after the Orange Belt merged with the ACL. The depot was in continuous use until 1967, when the building was converted for use for the West Orange Chamber of Commerce, an antiques dealer, and a hair salon. The Chicone family later bought the building and donated it to the City of Winter Garden to be used as the home of the Winter Garden Heritage Museum. “Train at the Atlantic Coast Line Railroad Depot in Winter Garden.” RICHES of Central Florida accessed April 19, 2019, https://richesmi.cah.ucf.edu/omeka/items/show/4652.